A fantastic way to kick off a then new action series. Friday 30th December 1977 is when The Professionals first burst onto our screens with their fast cars, semi-automatic handguns and laddish banter. This was an intense episode with a relentless sense of danger because of Nesbitt's radicalism (i.e. his attempt to poison London via the Thames river if the creation of chemical weapons wasn't stopped). 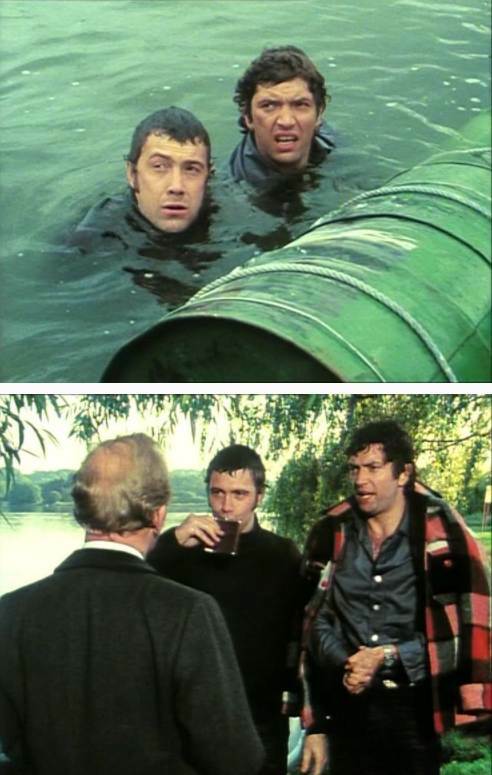 There were some great scenes such as Bodie and Doyle visiting Susan, Cowley at his most chilling as he threatened to inject heroin into Sutton (quite ironic seeing that a year previously, BBC1 banned Starsky and Hutch episode The Fix because of the same thing actually happening to Hutch), Bodie questioning Susan and then the no-holds-barred climax in which they go after Nesbitt. Director Douglas Camfield did an impressive job keeping the audience's interest at a high level, particularly when taking the POV of Nesbitt's hallucinating victims. This episode probably has the most iconic scene: Bodie and Doyle shooting empty cans of fizzy drinks off a wall. "Whatever we are, you made us", Bodie jokes. "Ta da!" Doyle responds, and the first we see of the chemistry between the two lads (based on this ep not being the first to be filmed). Really good story and lots of action and screeching car tyres - that's the type I love. Cowley, minus the obligatory 'series one' limp, is superb. The one major downside in this particular outing is Keith Barron. He always seems to overplay his characters - when Doyle shoots him in the shoulder, that's probably the worst piece of 'I've been shot' acting I can remember. (Ah, then there's the typical licking of the finger to taste whether it is a lethal drug or not). Love the ending where Cowley allows Bodie and Doyle, dripping wet from saving London, a nip of scotch, before the reprimand. Series one was understandably a 'getting to know the characters', so understandably there are some duffos, but 'Private Madness...' wasn't one of them. Another cool moment was when Doyle met Benny at the club. Very similar to a scene in The French Connection when Doyle pretended to intimidate his snout at the bar then became all pally with him in the gents before landing a blow on his jaw to carry on their facade. By this point, I think Benny was a drug squad detective working undercover then in Stakeout, he was a CI5 member. Cowley must have recruited him on Doyle's insistence after he helped nail Eric Sutton and Nesbitt in this episode. I wish we could have seen more of Benny in later episodes apart from just The Rack. Although I like this episode a lot, I'm going to squat up on other DVDs episodes and comment later. So I watched my first proper episode yesterday with ITV proudly showing a new batch of repeats edited for the ITV 4 audience of students and pensioners. First off we see Keith Baron, forever immortalised in my mind as an actor in that dire 80s comedy Duty Free. Yes I know he has been a billion things since but still, when I was a kid this is what we laughed at. But anyway, he’s looking quite young, fairly mad and dressed in military green and waving a rifle so he doesn’t look like he is going to be threatened with any canned laughter in this one. It soon transpires that drugs are involved and we head into the opening credits which due to it being ITV4 repeat time is the iconic titles and not the original first series ones. Personally I prefer the famous ones with Bodie punching his punching bag so I am happy for that to be there rather then anything else. It’s a bit like Magnum PI, the original first series music was rubbish, the second series onwards they had the iconic soundtrack so I’m always happy to hear that rather than their failed first attempt. Anyway…later we see a man enter his staff meeting much like I like to enter mine, completely spaced out and invading everyone’s personal space before jumping out of a window. Yes, at this point I am hooked, and if I was watching this first time round back in the day I would be a die hard fan by now. We then meet Bodie and Doyle shooting cans off a wall. I am surprised that Bodie is wearing a pink shirt as I would have thought that would have been ‘un manly’ but he has enough coolness and machismo to carry it off. Doyle I immediately want to laugh at due to his hair but then again he no doubt will be combing women out of his curls in future episodes so what do I know??? Check out Bodie's red shirt in Where The Jungle Ends especially at the end of that episode! Glad you enjoyed PMPD. I had it on a second hand video years back. Imagine watching that episode back when it was first shown on ITV on Friday 30th December 1977. Twenty eight years ago. That would have been exciting. Brian Clemens said it was chosen to be the 1st episode to be screened because it was a very good 'un. A fine episode. I love the by play between Cowley and the boys during the target practice scene. I think Old Dog With New Tricks is a better introduction to the characters and CI5 but it's easy to why LWT chose this episode to kickoff the series in 1977. It's a great episode! I like the way Doyle's past as a police officer factors in the story with his going to Benny for information on drug pusher Sutton. Nesbitt's idealism makes him an interesting and dangerous villain. Being driven by idealism doesn't make him any less threatening than a politically motivated terrorist. Two scenes really stand out for me. The first is when Bodie and Doyle are having target practice and their exchange with Cowley. A nice bit of humor and characterization. The second is when Cowley threatens to turn Sutton into a junkie. Gordon Jackson is utterly convincing and you really believe Cowley is willing to follow through on his threat because of the stakes involved. This episode must have been very exciting and different when it was first shown. Who wouldn't be back the following week for more? A side note. Bodie's pink shirt and checked jacket are quite scary looking in HD! Like you said, pr1, this would have enabled viewers to tune in for more episodes every week. What is also chilling about Nesbitt is how he had a drug addict under his thumb. Susan was willing to do anything for him to get her fix and Bodie's hospital interrogation of her was another dramatic moment, starting off as ruthless (like when he tells the nurse to shut up) then becoming a bit more gentler after she breaks down. Nice acting there from Lew. Doyle's expressions were priceless as well when he had to restrain Sutton as Cowley prepared the needle. You could tell he was ever so slightly perturbed. Also nice to see Frank Burnside as a CI5 agent. With better haircut than he had in The Rack. PMPD is a great episode and I would have loved to have watched it on original transmission as first episode. Gordon Jackson is superb, as he always is. It gets on my nerves whenever I hear anybody say that he wasn't suited to playing Cowley.